The nanoDSF (minituarized differential scanning fluorimetry) technology is a powerful method to determine the thermal and chemical stability of proteins by following changes in fluorescence, where the amino acid tryptophan serves as the main source for the fluorescence signal. We analyzed the stability of the light-oxygenvoltage (LOV) protein of the marine phototrophic α-proteobacterium Dinoroseobacter shibae (DsLOV), which does not contain any tryptophan residues. Further, we examined the impact of various mutations on DsLOV protein stability. 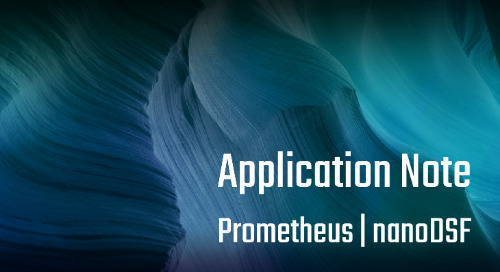 This study demonstrates the ability of the Prometheus NT.48 to analyze protein stability in samples that do not contain any tryptophan residues.